For a time when I was young, we lived in a house with a cluster of antique apple trees at the very back of our property. 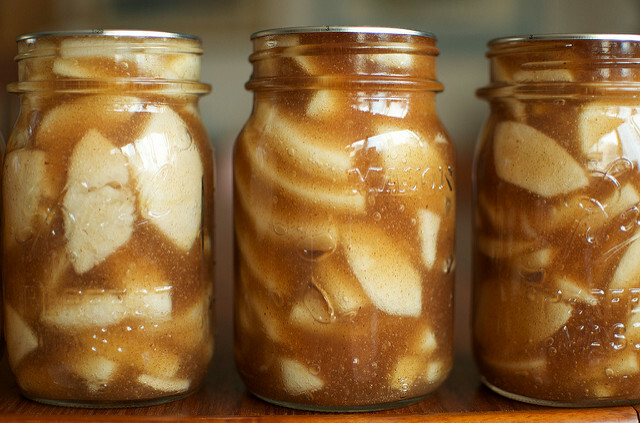 Thanks to this easy abundance, apples were one of the very first things I learned to preserve. In those days, my job was to help gather the windfall apples that seemed mostly whole until they filled a paper grocery bag. My mom did the rest, but I always stood by and watched. Later on, I’d help peel and core the apples (I absorbed a lot while watching). Both my sister and I would offer opinions about how much spice to add to the pot on the stove and when the sauce was all done, we’d sit down with cereal bowls full of warm, spicy applesauce. When the rest of the batch was entirely cool, I’d hold open plastic zip top bags while my mom spooned in the sauce for the freezer. Later on, we added apple butter to our fall repertory, but never felt the need to venture beyond those two basics with our apples. Pie filling was most decidedly not on the agenda, mostly because pies happened just twice a year (Thanksgiving and Christmas) and so there was no need to be prepared for a spontaneous pie. It’s only in the last couple of years that I’ve added pie filling to my personal canning routine and I’ve found it’s a nice preserve to have on the shelf. This time of year, a batch of apple pie filling is an easy way to put up several pounds of apples and it has a surprising number of uses beyond a basic pie. It tastes good stirred into oatmeal. If you have one of these old stovetop pie makers, you can make yourself a toasted hand pie with two slices of bread and a little smear of butter (it’s an especially fun project with kids). And, if you live in a household with an avowed fruit pie hater, you can make yourself a teeny tiny free form crostata with leftover quiche crust and a pint of filling. Not that I’d know anything about that. When making pie filling, there are just a few things to remember. The first is that you need to use Clear Jel , not cornstarch (and if you can’t find Clear Jel, it’s best to can your filling without thickener and add a little cornstarch slurry just before using it). The second is that no matter the size of jar you use, you need to leave a generous inch of headspace. Pie filling expands during processing and really loves to ooze out of the jars when they’re cooling. Proper headspace can help prevent that. Third thing is that when you put the rings on your jars of pie filling, you tighten them just a little bit more firmly than you do for most other preserves. Often, you’ll hear me raving about how you don’t want to overtighten those rings but in this case, a little extra twist helps keep your product in the jars. Finally, make sure to follow the instructions in the recipe and leave the jars in the canner for a full ten minutes after the processing time is up. Turn the heat off, slide the pot to a cooler burner, remove the lid and let the jars sit. This slower cooling processing will help prevent that dreaded loss of product. Really, the hardest part about making pie filling is keeping it in the jars once they’ve been processed. Oh, and one more thing. 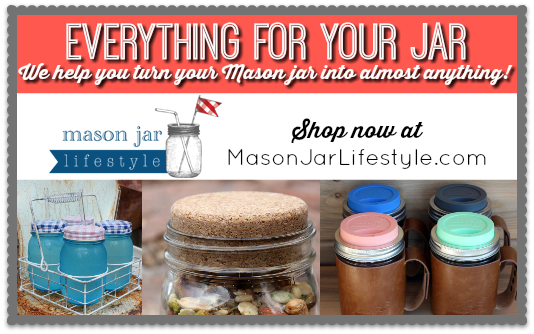 Notice those air bubbles in the jars? Pie filling is thick and really likes to trap air pockets. Bubble your jars as well as you can, but don’t kill yourself over it. For those of you who make pie filling, do you have any unconventional uses? 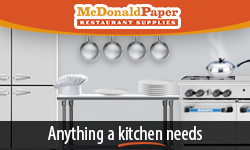 Prepare a boiling water bath canner and six pint jars. Put new lids in a small saucepan and bring to a gentle simmer. 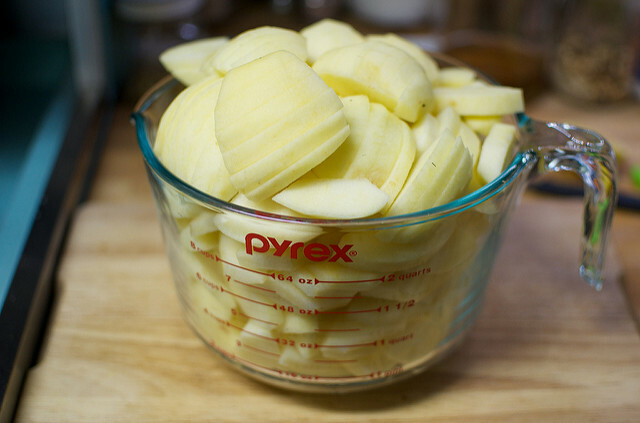 Bring a large pot of water to a boil and blanch the apple slices for 1 minute. Remove them from the pot and place them in a bowl of cold water with a splash of lemon juice in it. In another pot, combine the apple cider, water, and lemon juice. Set over high heat. While it heats, whisk together the sugar, Clear Jel, cinnamon, nutmeg, ginger, and cloves. Stream the sugar mixture into the water and juice, whisking well to incorporate without lumps. Bring a boil and cook, stirring constantly until it begins to thicken. 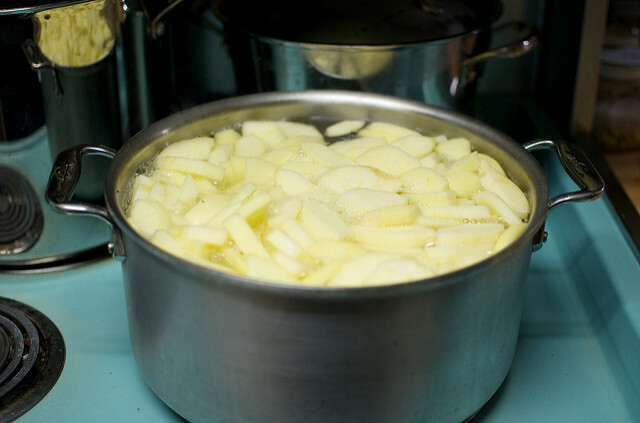 Once the canning medium has thickened, fold in the apples and remove it from the heat. Fill the jars, leaving a generous inch of headspace. Wipe rims, apply lids and rings, and process in a boiling water bath canner for 25 minutes. When time is up, turn the heat off, remove the lid, and slide the pot to a cooler burner. Let the jars sit in the water for an additional ten minutes. This will help minimize the pie filling from siphoning out of the jars. Once that time is up, remove the jars from the canner and set them on a folded kitchen towel to cool. Makes 6 pints or 3 quarts. Processing time is the same for both sizes of jars. Adjust processing time is for sea level. If you live at a higher elevation, please adjust accordingly. Thx for the timely post. Im headed to Eastern WA and plan to hit an apple festival. Ive already put up plenty of applesauce and have been looking for pie filling recipes. I have Ball liquid pectin. ..is that the same as Clear Gel? It is not the same. Clear Jel is a modified corn starch that comes in powdered form. It is most definitely not the same as liquid pectin and the two are not interchangeable. Figures, I find the apple pie filling canning recipe I was looking for on the very same night the government is opened back up. Now I have to go back to work and I have apples overflowing my kitchen. Do you have a canning recipe for peach pie filling as well? Oh the other thing I forgot to ask, does the 25 minute processing time take into account high altitude? I live more than a mile above sea level and usually have to cook in the water bath a good 15 to 20 minutes longer than a recipe calls for. Cheryl, I live at sea level so all my recipes are written for that elevation. You should always increase your processing time for your elevation. Can I use a pressure cooker/canner? If so, how long should it process? I wouldn’t recommend processing this pie filling in a pressure canner. It has more than enough acid to be safe for the boiling water bath canner. What’s more, the heat and intensity of a pressure canner would make this product siphon even more than it already has a tendency to do. Oooooh! Looks wonderful! Am heading out to Linvilla Orchards tomorrow. Any suggestions as to which apple varieties will hold up in wedges and not turn to sauce in the jars? Judy, here is a table which suggests which apples are good for different purposes. I hope this helps! Can I replace the sugar with Splenda or other sugar substitute ? In this recipe, sugar isn’t playing a thickening role, so you certainly can swap it out for Splenda. However, I don’t know what the conversion would be. I used coconut sugar in a 1/1 ratio. Thanks for this “if you can’t find Clear Jel, it’s best to can your filling without thickener and add a little cornstarch slurry just before using it”. I’ve been frantically reading all the apple pie filling recipes I can find. Some say you must use ClearJel, others say that Cornstarch is alright. It just seems strange to me that if it’s so required for making pie filling, that it’s not available in stores. By avoiding the ingredient altogether and adding thickener when I make the pie/whatever itself, this is great. 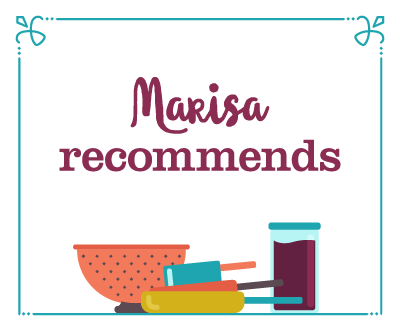 PS – I’ve been waiting for a pie filling recipe on your site! Thanks so much! It’s not required for making pie filling if you’re not canning it – apparently the processing doesn’t work well if you use regular corn starch (additionally, it’s not an “approved” canning addition, so there may be safety concerns as well). I think it gets too thick, thus potentially hampering the heat penetration of the product. Not hot enough in the middle -> not safe. I have canned apple pie filling with cornstarch instead, but I won’t do it again. It REALLY jelled up in the jar after processing, sort of turning it into one big blob standing away from the sides. We still have a few jars from last year because nobody really wants to eat it. It tastes ok, if bland (probably not related to the thickener), and no one has died of eating what we have used, though. I have also read that cornstarch may only have enough “oomph” to thicken once, in this case after processing, so it wouldn’t really work properly in the pie afterwards. I used cornstarch when I canned pie filling last year, as I was a rookie and followed an old recipe. It was fine. No one got sick out of the 11 jars used, but it didnt look very pretty when it was dumped into the pie crust, and it did not re-heat very well. Some parts were very watery, while other parts were thick. I learned my lesson and get clear-jel. You can get it on amazon, from some Amish stores (if you live near any), or from SBCanning’s fb page. I turned my neighbor on to clear jel finally this year, she had done pie filling for 40 years with corn starch and seemed reluctant to change. I had it shipped in to her and she did 100 qts this fall! She now raves about clear jel and how wonderful it is. She even did 24 qts. for me…she’d gotten a new peeler and between it and the clear jel she was having a blast. I got my Clearjel at King Arthur Flour. I would not use as much next time though. My mixture was a huge glob so I used more apple cider and a little more lemon juice. I ended up with 4 quart jars. I found it at a bakery supply store. Also saw this at amazon.com. . Can’t wait to try this out. I find that a terrific substitute for the Clear Jel is the King Aurthor Flour pie filling enhancement. It’s great in most pies and one bag will work for this 8-jar recipe, and you might have some left over. I can’t wait to find out! Can you confirm if pasteurized cider is ok or this recipe. Thanks so much!! You can use any kind of apple juice or cider you want. Pasteurized is fine. It’s a dreary day here today, so this just might be my project! Thanks for the tips about how the pie filling expands…good to know! Brilliant suggestion to just leave out the Clearjel! 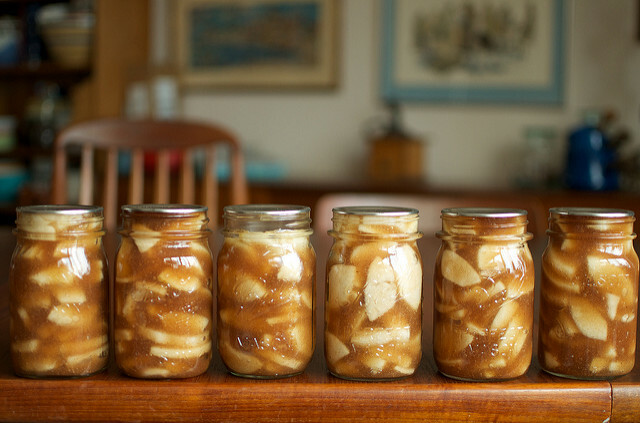 I’ve been avoiding canning apple pie filling because of it, and this completely solves the issue. Looking forward to trying it out! Oh how I needed this a couple of weeks ago! I recently had my first try at apple pie filling and ClearJel, needless to say the recipe was not as good as yours and it was nearly disasterous. Thank goodness for the canning helpline! I too have had trouble with locating Clearjel! Question though~ If the Clearjel is left out, should the amount of water be adjusted? Adjusting my plan to include apple picking today! Thanks for your website, without you I wouldn’t be a canner! You’ll still need the same amount of water to serve as canning medium. Getting 80 lbs of apples tomorrow and I was planning on canning some apple pie filling. Thanks for sharing your apple pie filling recipe! I need search no more, for I know this one is the best! Will it be okay to double the recipe or should I make one batch at a time? You can certainly double the recipe, though you’ll need a giant pot to accommodate all the pie filling. I have made apple filling for several years and am always looking for different ways to use it. Some of my favorites are to make a layered baked apple french toast in the oven and a fruit pizza with an oatmeal crumb topping. My new experiment this year was to fill a batch of cinnamon rolls with it and top with cream cheese frosting- I will be making those again soon!! Yahoo! Doing this today and will be sharing the jars in Christmas gift baskets. Thanks so much! I too am unable to find the clear jel in Canada and US will not ship it here. I will try without, but sure would like a source for it here. 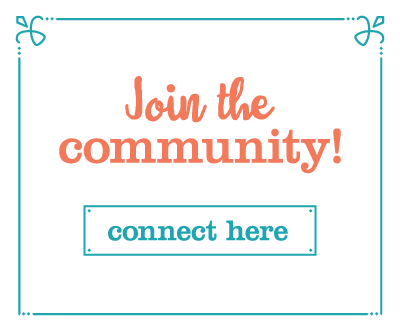 I really enjoy your blog and have tried many if your recipes. I hope to receive your book for Christmas. It appears to be available through Amazon.ca. Does one pint jar = one pie? Thanks. Typically, two pints equals one pie. You could can it in quarts for an easier conversion. I do mine in quarts for added flexibility. I can make smaller pies or eat the filling in oatmeal without a giant quart jar taking up room in my fridge. 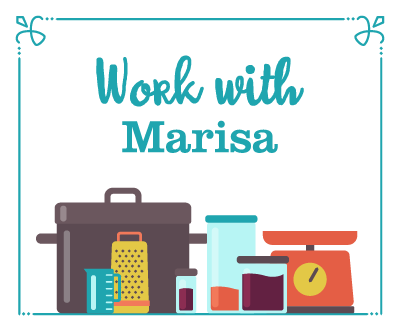 Marisa, what about using half gallon jars? How long would the water bath need to be? I made quart jars last weekend and got rave reviews, but one quart isn’t enough for a large deep dish pie. I made my first batch of filling using ClearJel a few weeks ago – it was stunning how quickly it thickened, and how thick it was afterward. I’ve never used anything like it. Wild. Such a timely post! I was just situating my brain around putting some pies in the freezer, but I’m never truly happy with this. They take up so much room, are so time-consuming when I don’t really have a lot of spare time, I’m never really happy with the results, and they are so easy to pop in the oven that my husband is always filching them to feed his sugar addiction–which creates major unpleasantness in this particular husband. Ahh! My aunt always talks about canning peach pie and apple pie fillings, but I’ve never really latched on to the idea. I know not why. But, now, I’m thinking I’m going to try out your method as soon as I get these greenhouses laid by. Maybe, Sunday. I’ve been using several of your recipes and am pleasingly impressed. You’re doing a fine job. Thank you. By the way, what would you think of using all cider instead of cider and water? I could probably cut the sugar a little more that way, huh? Would the liquid get too glucky without the water? Happy to try this recipe this weekend. I personally never use thickener aside from a little flower when making apple pies and turns out fine. As long as one uses baking apples and not eating apples! Don’t know if this is a stupid question – would it be okay to leave the peels on? I like apple peels and I also REALLY hate peeling apples cause I’m not good at it. 🙂 I’m also curious about using all cider – that sounds yummy! We do qts. and find if you make big or deep pies, 3 qts. work well for two pies. If making only one big pie may use one qt. and add some blueberries or something to fill it up more. So just for clarification, if you don’t have Clear jell, you follow the direction exactly as written and add corn starch later when you make your pies? So you don’t add liquid or powder pectin to it when you prepare it for canning. Thanks. 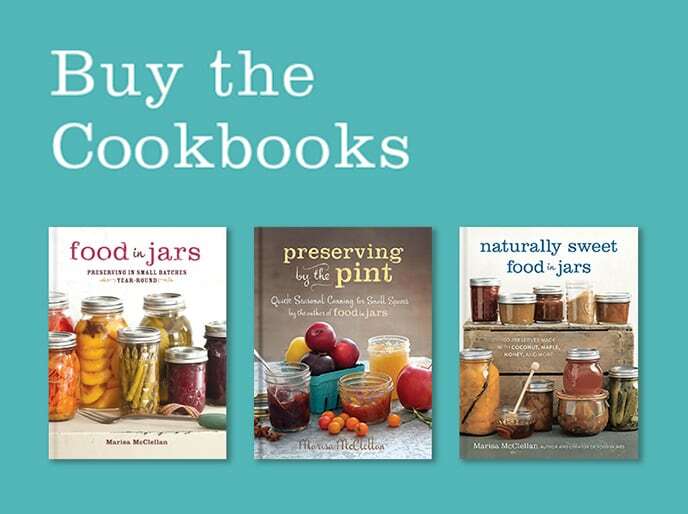 I have your canning books and I love it. I have tried several recipe and they tuned out go. I just made apple pie filling using a recipe very similar to this. It is great. I immediately made a pie for my sister. I can mine in both quarts and pints. I use the pints for the 2 of us and the quarts when we have guests. It is nice to have something so good and quick when I need a dessert. I am fortunate that I can buy the Clear-Jel at a local Amish store. Does anyone know how long the Clear-Jel powder can be stored? I have a good bit left and need to mark it’s use by date. Funny. I just did a trial run on the recipe (pretty close, anyway) and found that I’m going to need to make quarts and pints inasmuch that it takes about 1 1/2 quarts to make a good sized pie in my preferred pie pan. I’ve been told by our extension agent that Clear-Jel has a very long shelf life–several years if kept clean and dry. Amazon has Clear Jel and Instant Clear Jel. Which one should I buy? You want the regular for this, it thickens as it cools. Yay! Thank you for recipe! I’m going to scrump some apples this weekend. Thanks for this post! It is very timely as I am hosting a girls night tonight with the intent of canning apple pie filling. I love your extra tips! Stupid question. How do you then use the filling to make a pie? I saw in an earlier comment that it takes 2 pints for 1 pie, but how long would you recommend baking it for and at what temp? I want to make some and give it away as gifts and would like to have instructions to go with it. Thanks!! I’d bake a pie made with pie filling at 425 degrees F for 30 to 35 minutes. Really, you’re just cooking long enough to fully brown the crust. Thanks, Judy, for the information on storing Clear-Jel. All my pie pans are my preferred ones! The deep dish does take 1 & 1/2 quarts, a regular one takes a quart. I have a deep dish personal pie pan that takes a pint. It’s the one I use for hubby and me only. Even though it’s a”personal” pie pan there is enough for 2 generous servings. I REALLY want to toss aside my weekend to-do list and make a batch of these, Marisa. Great tutorial. just a reminder to all you home jelly and jam makers… save your apple peels and cores! these are full of natural pectin, and can be used to thicken jams and jellies. you can even make your own pectin from them. see this tutorial: http://foodpreservation.about.com/od/Preserves/r/Homemade-Apple-Pectin.htm. They should be fairly thin or they won’t soften appropriately. Can you use fresh lemon juice instead of the bottled? I do not want the preservatives from the juice in the apple pie filling.. In this recipe, it would be okay to use fresh lemon juice. I made some pie filling with a friend and they were overfilled. Some of the filling leaked out and the jars where quite sticky, but the seal held. Are they ok to save? Or do they need to be refrigerated? The seal is the thing, if it’s good, the jar is good. Be sure to carefully clean ALL the residue from the outside of the jar. Mold will form if you don’t, and that’s really icky to find later on. Thank You, for getting back to me with my other question. This is my first time canning and want to get it right. This is the most informative website I have found. I live in long island, NY and am confused about sea level? Where do I find out if I am above sea level and how would I adjust accordingly? Some of my filling leaked out after canning (the jars were too full). The lids are still sealed and tight. Are they still ok to use? Or should I try again? As long as the seals are good, it is fine. Leaving the jars in the canner for a few minutes after processing should help minimize that loss, but it does still happen on occasion. Last week we finished putting up over 30 quarts of applesauce, apple butter and apple pie filling. We give away much of it in holiday gift baskets, along with homemade bread with the applesauce as one of the ingredients and homemade dry soup mixes and various other goodies. The baskets are always a big hit with family and friends. This blog is a fantastic resource; count me as a new regular reader! I was thinking about canning applie pie, just last weekend, thank you for this récipe, I just have a question. Here in Guatemala, central america there is no Clear gel so I’m going to leave it out, but my question is when I’m making my pie, in what point do I add the cornstarch sluchie? 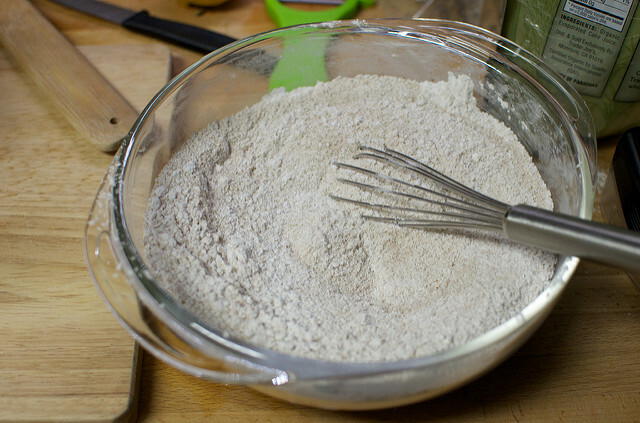 When your pie crust is ready, pour the pie filling into a bowl and whisk in a cornstarch slurry. If you want to ensure that it sets up, you could even drain off the juice from the fruit, pour it into a saucepan, add the slurry and heat until it thickens. Put the apples in the crust and pour the thickened liquid over them. Top and bake. “no need to be prepared for a spontaneous pie” I’m horrified. There is ALWAYS a need for Spontaneous Pie. Thanks so much for this! I made it without the Clear Jel and it was fantastic. I made my first pie tonight- yum! Instead of adding cornstarch I boiled the liquid down with a little butter until it was almost caramel like. I poured the carmelized liquid over the apples in the pie- so so so delicious! I will use this recipe again and again. I have made pie filling with a recipe very close to this for years and it is sooo great. Glad to see this on your site and thanks for the no clearjel tip but especially the head space tip! That took me a couple of years to figure out and what a mess! An inch head space is about perfect but it is different than most canning recipes. I found clear jel at my local kitchen supply store. The one where you can buy all the unusual kitchen implements, the gluten free flours, the bulk suppy beans. I think almost every decent sized town has one. The first time I did over thicken the liquid but it wasn’t a problem, it will thin a bit when it’s heated. If I am doing multiple pounds of apples I do them in batches so they are still hot when they hit the canner. If you are going to do more than your water bather will hold then do smaller batches so the hot pack is still hot when you put it in. One way that I use these is to take left over flour tortillas, make a “burrito” by folding the apple pie filling in them, place side by side in a pie plate, brush with butter and sprinkle with cinnamon sugar. Bake at 350 until they are brown and bubbly on top. We always have left over tortillas and this makes a delightful way to use them up. I made a double batch of this apple pie filling today. It looks and smells great, but the proof will be in the pie. I’m not able to compost the apple scraps, and the thought of just throwing the cores and peels away pained me. Instead, I put the cores and peels, along with two vanilla pods split down the middle, in a large pot. I covered it with water, brought it to a boil and then reduced the heat to a gentle simmer. I left it simmer, uncovered, while I made the pie filling. I cooled it, removed the peels, cores and vanilla pods, and filtered the liquid through a double layer of fine cheesecloth. I then returned it to the pot, added about the same volume of sugar as I had liquid, and simmered until it thickened. I cooled it and ladled into two bottles. It’s a very pretty, intensely apple syrup. Can’t wait to try it in oatmeal and over pumpkin pancakes. I think I’m going to make this syrup every time I make an apple pie. It’s a very satisfying way to feed my desire not to waste food, even scraps. Thank you so much for this recipe! I have a huge basket (greater than half-bushel) of apples in my kitchen just waiting to be canned as pie filling. One question – I made my first batch today and, when I took it out of the water bath, there was a good inch of liquid at the bottom of the quart jar and the apples were floating. (I’m not using Clear Jel, as I want these apples processed ASAP, and I don’t want to wait for Amazon to deliver.) 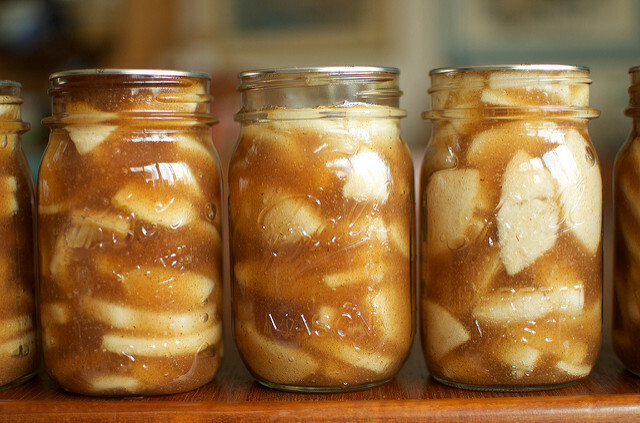 Would it be better to try and pack more apples into the jars next time, or is there a minimum amount of canning liquid that is necessary for proper storage of the filling? Thank you for the recipe I tried a small batch and it is yummy. I used Thick Gel made by a company called Cornaby’s. Clear Gel is made with GMO corn. The thick Gel is organic, gluten free, made for canning and freezing and is used exactly the same way. Can you use fresh squeezed lemon juice? Just received two large boxes of apples, going to make this recipe today!!! looks and sounds delicious. It will be great to have on the shelf for when I get the urge for some apple turnovers-either use puff pastry or pie dough grab a jar of apple pie filling-and you have almost instant turnovers or hand pies!! Thanks for a great recipe! Clear Jel and pectin are not the same things. There’s nothing else that substitutes safely for Clear Jel. It’s designed specifically to be heat stable. Can you use regular apple juice? And do you have an idea about how much slurry to add after canning? I want to give them as Christmas gifts this year. Thank you. Yummy looking recipe. Can this be made with Splenda instead of sugar? I’m diabetic. My sister & I substituted the apples for peaches and oh boy! were we satisfied! We licked every spoon clean… And made sure to scrape out what was left in our dutch oven. Instead of apple cider, we used the peach infused water from boiling after blanching our peeled and chopped peaches. It is heaven!! Our’s did not, however, expand. After processing and removing, our filling levels remained the same. I almost wished we would have added an extra half inch. Adding a vanilla bean would be really good as well. Thank you for such great inspiration! 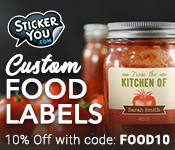 I’m a huge new fan of yours & will be doing a batch of your pickled cherries tomorrow! Thank you, thank you! I know this is an older post but I just went apple picking and have a ton of apples to can! But my question is how do you keep them from turning brown between peeling, slicing and cooking? Mine see to turn so fast it seems inevitable. I’ve tried a little lemon niice and water, but yours look absolutely perfect! I really didn’t do anything beyond working quickly. Can I double the recipe to make 6 quarts and still can safely? I’ve seen some recipes that say don’t go beyond doubling or tripling. Thank you! Apple picking is on the list for this weekend. Yes. You can double this preserve because it doesn’t need to reduce in the same way that jam does. Just make sure you’re using a big pan to accommodate the volume of filling! I made these today without the Clear Jel. I let the liquid-spice-sugar mixture reduce some, but it definitely wasn’t syrupy. I still left the generous inch of headspace. Now looking at my jars, I see some apple slices not covered by liquid. Will this compromise their safety and/or deliciousness down the road? Should I redo them with a more reduced liquid? I,too, have the problem of my apples not being completely covered by the syrup and was wondering if it will affect the quality of the pie filling? I have the same problem… now what? Make some apple pies quickly, I guess! Unless someone has a better idea? As long as the seals are good, the apples will still be fine. The ones that aren’t covered by syrup may discolor a little, but they won’t be unsafe to eat. 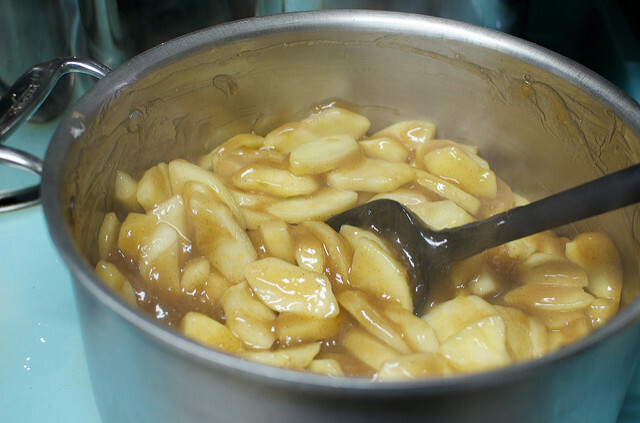 Have you ever used maple syrup to sweeten this apple pie filling instead of sugar? I would prefer to use maple syrup, but am not sure if it makes a difference when canning. Unfortunately, maple syrup can alter the acidity of the finished product and render it unsafe. You could use maple sugar, which doesn’t impact the finished acidity in the same way. Thank you for responding to my maple syrup recipe! I have one more question, could I leave out the clear jel and thicken the apples as needed once I open the jar? Yes! Leaving out the thickener is totally fine. Hi Marisa, I’m wondering how much ClearJel or cornstarch should I use for a quart of filling to make a “slurry” after opening since I didn’t have ClearJel at the time of canning? I typically use 1 to 1 1/2 tablespoons for every quart of pie filling. I tried this the first time without thickener, but the apples seemed to lose all structural integrity. I was using fresh, crisp apples, so the result was a little mystifying. The second batch with the same apples a few days later had thickener (was waiting on Amazon for it…) and I skipped the blanching step. These definitely retained their apple shape in comparison. Out of curiosity — why include the step where you blanch them? Because according to the National Center for Home Preservation, that’s how you’re supposed to do it. And because it worked, I didn’t question the necessity of that step. Ah, thanks! I’m relatively new to canning, so wanted to make sure I wasn’t skipping steps that I shouldn’t be skipping. Maybe getting them into colder water more quickly or blanching smaller batches at a time will help the apples hold their shape. Do you immediately drain off the cold water or do the apples sit in the cold water until you’re ready to fold them in to the sauce? It can depend on the type of apple your using, some are softer/mushy when cooked whilst others retain a little texture. Just made this with apples from a local orchard- delicious!!!! Thanks so much for the recipe..
Hi, I am going to leave out the clear jell. Will the. Canning medium still thicken in step #4? It will not thicken without the Clear Jel. Hi there! I just ordered my clear jel and I’m planning on making this next week. 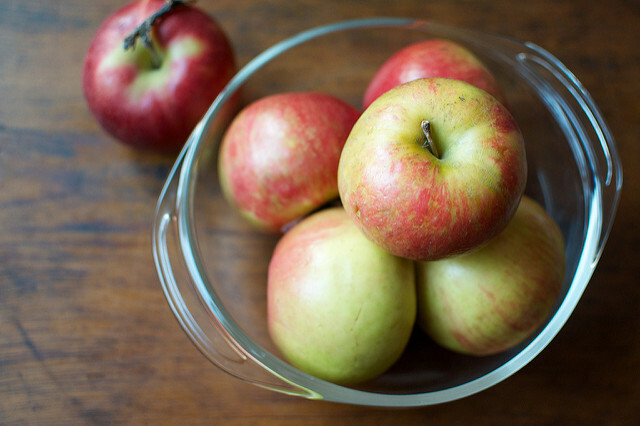 What are the best varieties of apple to use in filling? I’m guessing granny smith, just like a regular pie? Or a variety? Make sure to use something with a sturdy texture. Soft apples will dissolve. I knew you’d have a recipe with less sugar than the one I’ve used in the past. Thank you! I have a ton of apples and was wondering if you think the apple peeler/corer/slicer would make the apple slices too thin. I think in the past I’ve cut them by hand so they have a thicker slice but it would be so nice to be able to get through them faster. What do you think? I like to do them by hand for bigger chunks. Nope, no tapioca is not recommended. Do you think cranberries could be safely canned with the apple pie filling? If not, I’ll just add them when I open the jars 🙂 Thanks!! I missed this one last year – and am so glad I found it this year. I have found a source for clear gel in Canada!! I used honey crisp apples and they have held up nicely from start to finish. We also eat this with cottage cheese. Hi there! So I have kind of a general question about canning apples. Do I really have to peel the skins off of the apples before canning them? I really like the peels and am trying to save myself some work! 🙂 ) thank you so much for such an informative website!! The peels are going to give you a really unpleasant texture in the finished product if you leave them one the fruit. Ben, there’s so much variation in the water content of fruit that it’s hard to nail the right thickness every time. I’d suggest increasing the amount of flour or cornstarch she’s using to improve the set. I have an electric pressure cooker that is also a canner and was wondering how to can the pie filling in it? I just bought several 6 cup canning jars from a thrift shop, I am going to fill all of them with your apple pie filling and sell them at a flea market in October. I’ll paint the lids with chalkboard paint and label them with chalk. How fun! Thanks for the amazing idea! Kitty, as far as I know, there’s no such thing as a 6 cup canning jar. It’s not recommended that you can this pie filling in anything larger than a 4 cup, quart jar. Nope. They are very different products. I am not sure what is meant by, “This will help minimize the pie filling from siphoning out of the jars.” How would that happen when the the lids and seals are on the jars? Sorry for being a dunce here, but I can’t figure this out. When you take jars out of the canning pot, the seal hasn’t actually been formed yet. And so, there is still space for liquid to seep out of the jars, even with the lids and rings in place. Can you please tell me the shelf life of this? I’d like to give as a gift. Like nearly all other homemade preserves, this one keeps for at least a year. When you leave the jars in the hot water aftter the time is up,,,to keep it from siphoning out ….what exactly does that mean? I’ve never heard of that…. Siphoning is the loss the of liquid that occurs when the pressure inside the jars changes rapidly. So…baking instructions for pie? Like normal? 400 for 10 mins then 350 for 30? Can’t find Clear Jel around here. Can I use cornstarch instead? No. It is not canning safe. I would like to know what type of apples work best for this recipe. I know that a macintosh wouldn’t be the best. What have you used and it worked well? Thank you! Apples that hold their texture like Granny Smiths are a good choice. Can I substitute 100% apple juice for the cider? Can this recipe be made with crabapples? No. The only thing crab apples are good for is jelly or butter. First recipe with the 60 pounds of apples that I bought this year from a local organic farm. Also first time trying this recipe. I thought that blanching the apples was a little odd. We are at 6500 feet altitude so processing time is 40 mins. I was sure the apples would be tender enough after that amount of time, but since it was my first time trying the recipe, I followed the recipe. I used some leftover Speculaas Spice for seasoning. I was expecting the canning liquid to boil like jam but it was more like a pot of volcanic lava due to the thickness of the sauce using Clear Jel. The tips about headroom, tightening rings, and the 10 min wait before removing jars from the canner were very helpful. No product seeped out of the jars and every jar sealed. CNt wait to try it.